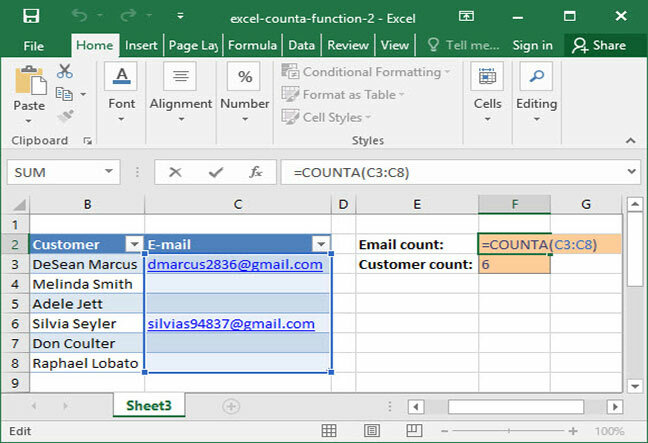 If you're familiar with Excel's COUNT function, you know how to count the number of cells in a range that contain numerical values. But what if you want to count the number of cells in a range that contain any value — including strings of text? For this task, unfortunately, COUNT falls short. To solve the problem, Excel has a similar, equally-useful function: COUNTA. COUNTA works exactly like COUNT, except that it includes all cells, not just those with numerical values. COUNTA includes cells with text, errors, and numbers — anything that isn't blank. If you aren't yet familiar with the COUNT function, learning about it can be helpful in advance of this tutorial. Take a look at our overview of the COUNT function for more information. When fed one or more ranges of cells or values, COUNTA will output the number of cells or values that are non-blank — meaning that they include either numerical values, strings of text, or errors. The above formula outputs the number 2, because there are 2 arguments provided, both of which are singular inputs (a number and a string of text). This formula spits out the number 5, because there are 5 static inputs provided. Note that even the empty text string ("") is counted as non-blank. Of course, counting the number of static inputs to a COUNTA formula isn't particularly useful. The function becomes much more versatile when we use it to count the number of non-blank cells in a range. This formula evaluates to 2, because there are 2 e-mail addresses present on the list (and thus 2 non-blank cells in the range C3:C8. Calculate the number of days of data available in a data set.